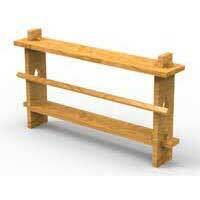 This plate rack is designed for use in a room furnished in mission style. The dimensions may be changed to suit the wall space. The parts are held together entirely by keys. The bar across the front is for keeping the plates from falling out, but this may be left out if the plates are allowed to lean against the wall. 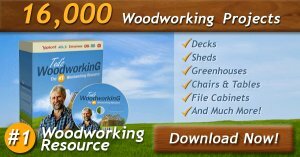 The following list of material will be needed, and, if the builder does not care to do the rough work, the stock can be ordered planed, sanded and cut to the exact size of the dimensions given. 2 ends, 7/8 by 5 by 20 in. 1 top, 7/8 by 6 by 36 in. 1 shelf, 7/8 by 5 by 36 in. 1 bar, 7/8 in. square by 36 in. 4 keys. Scrap pieces will do. Lay out and cut the mortises on the end pieces for the tenons of the shelf, also the tenons on the top ends and the diamond shaped openings. In laying these out, work from the back edge of the pieces. Cut the tenons on the ends of the shelf to fit the mortises in the end pieces, numbering each one so the parts can be put together with the tenons in the proper mortises. Mark out and cut the mortises in the top to receive the tenons on the end pieces. In laying out the mortises for the keys allow a little extra on the side toward the shoulder so the ends and tops may be drawn up tightly when the keys are driven in the mortises. 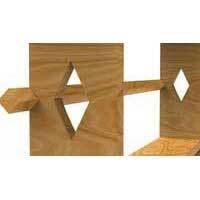 All the mortises and diamond shaped openings should be marked and cut with a chisel from both sides of the board. 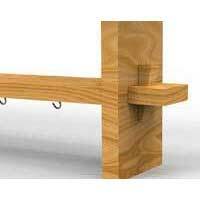 If the bar is used, it may be attached with a flat side or edge out as shown. Finish the pieces separately with any weathered oak stain. 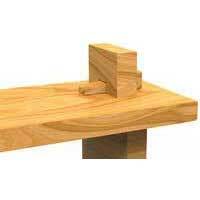 When thoroughly dry, apply a very thin coat of shellac. Finish with two coats of wax. 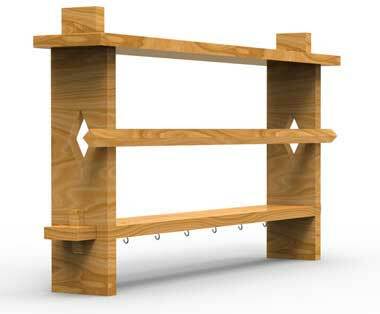 The rack can be attached to the wall by two mirror plates fastened on the back edges of the end pieces.